In Topic: I know most don't dig retro but I built one any way. have a look. I like them. 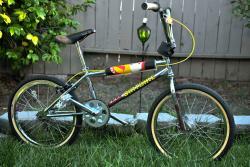 I have no issue with modern bikes reissue/retro or otherwise. It is after all still a bike. Richard Vogt makes some note worthy observations. I think the answer is "Yes" re the frame being able to accept a motorcycle fork. But of course I am not the person to ask. Really cool before and after images and work to get to the after images, which is first class. A few details that make it extra nice: The original bike shop sticker, how nice the crank and sprocket look and of course the nickle on the frame. It is only original once. From having lived it what JMC said is what I recall.